If you’d like a true demonstration of how far phones have evolved in 15 years, look no further than this new Windows Phone game. Pocket-lint found the game, which was developed by Willem Middelkoop. It lifts the entire interface of a classic 1997 Nokia phone and transports it onto a modern phone. Snake ’97 plays like the original, meaning yo uhave to press number keys to move your snake around. The goal is to come close, but not crash into the wall or your own tail. If it looks familiar, well that’s because it’s based on the old Snake arcade and computer games. The Nokia interface looks photo realistic and haptic feedback on the buttons makes it feel almost like the real deal. We gave the game a quick test run on our Nokia Lumia 710 and it looked pretty accurate, right down to the lag you experience when playing it. Purists will be happy with this one. 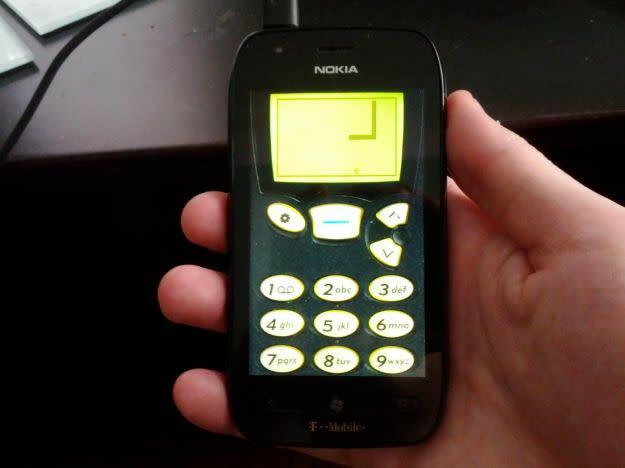 You can download Snake ’97 on the Windows Phone Marketplace. Do you know of any other classic remakes like this? Nokia CEO Stephen Elop hints at new Windows Phones, possibly as soon as MWC?